Raise your hand if you’re ready for another easy project? (You are raising your hand…right?). If you have any special little girls in your life, this one’s for you. I don’t have any daughters of my own but I am blessed to have three adorable nieces – they help me get my girl-fix. The pink, the frilliness, the sparkle – how can one resist? One of the trends that I find adorable in girls’ fashion is the use of headbands with big bows or flowers. Crocheted bows and flowers happen to be very simple to make and are an excellent project for beginning crocheters. 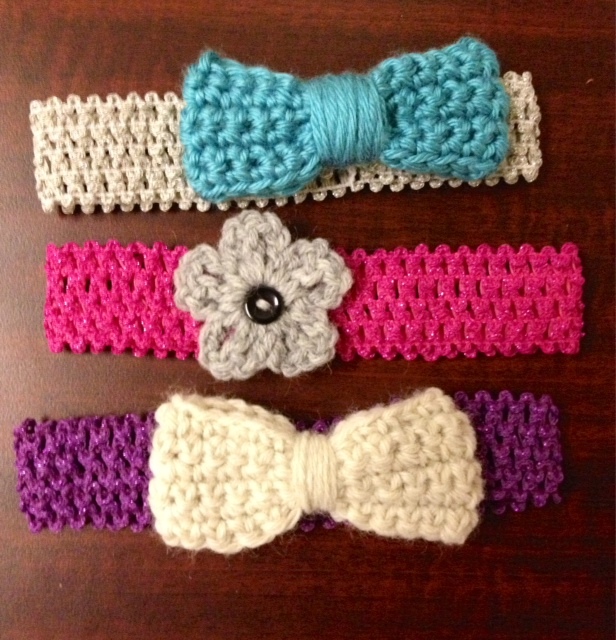 Headbands are also fairly easy for beginners to make – and there are lots of patterns available online. You can find patterns for a simple headband or a more elaborate headband. However, for this project, I decided to use headbands that can be purchased at a store — hence why I call them “cheater” crochet headband because really we’re only going to crochet the bow and flower (by the way, I got these headbands at Walmart). I like that they are elastic so that they can fit snugly and stay put on a little girl’s head. Row 1: sc into second chain from hook, sc to end. 24 sc total. Chain 1, turn. Row 2: sc in first chain, sc across. 24 sc total. Chain 1, turn. Row 3-5: repeat row 2 instructions. Row 6: repeat row 2. Cut off tail at least a foot long and fasten off. Using the tail, sew together both short ends so that you have what looks like a cuff. Pinch in the middle to create the bow shape and with the remaining tail, wrap several times around the middle. Make sure to stay centered otherwise you’ll end up with a lop-sided bow…unless of course you’re deliberately going for that look. Now that your bow is ready, sew it onto the headband. There are as many patterns for crochet flowers as there are flowers themselves. I really enjoyed the video tutorial from The Making Spot. In it, we are taught how to make a very basic five petal flower. Before you hit play, I do need to caution you that they use UK crochet terms. So when you are instructed to do a “treble stitch” you will be doing a double crochet stitch (the US equivalent). A slip stitch is a slip stitch in both UK and US terms. You can make different size flowers by varying the size of the hook and then layer the flowers for a more dramatic look. For this particular style of flower, I don’t like the look of the hole in the center so I usually sew on a button. 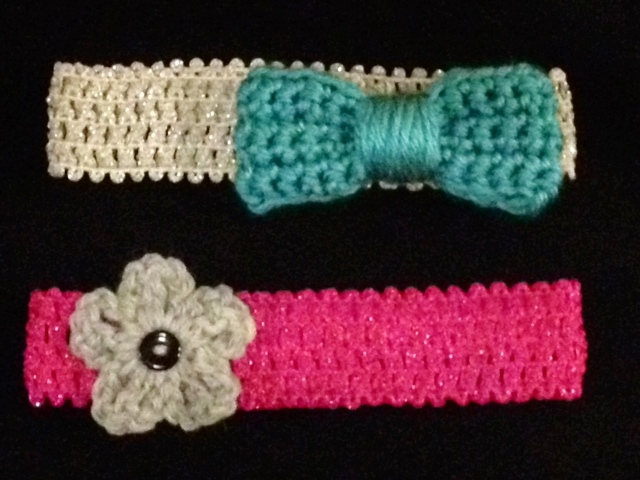 You can see in the picture above that I used a black button for the grey flower on the pink headband. If you want something more dramatic you can check out the May Roses pattern from Attic24. Tell me: are these cute or what? Try making them for the special girly girl/s in your life. So glad you could make it to the Land of Crochet! My name is Noemi Garcia and I will be your guide. When I'm not working on a crochet project (and clocking in time at my day job), I am busy being mom to my energetic and too-smart-for-his-own-good son. My husband and I very proudly call Reno, Nevada our home. Grab a cup of coffee (I won't ask what's really in your mug) and make yourself comfortable. Have your thread and hook at the ready and explore the Land of Crochet with me.